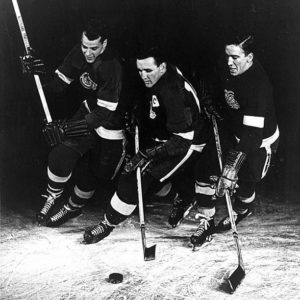 Left to right: Thompson, Sutton, and Lefevre manufacture another win Tuesday despite skating too closely together early in the second period. Thompson had two goals and two assists, with Lefevre adding a goal and an assist as the trio led the team in breakout after breakout, connecting on cross ice passes the turned into easy tap in goals. Defensemen Sean Payeur and Robbie Kuehnlein each added a goal. “We manufacture goals,” said Sutton (goal, 4 assists) matter-of-factly. Noting that Sutton was being a bit short-sighted, GM Mark Woods spoke to the bigger picture. “They manufacture wins and ultimately championships.” Woods recently received the Ken-Holland-of-the-Nineties award following Ruination’s ninth championship since coming to the front office. “It’s Supply Chain Management 101,” said Woods, stretching the metaphor to tortured lengths. ← What a Deal – Lopez Found!